The Rio Gallegos River is nearly 300kms in length and has its origin in the Southern Andes with two pristine and very beautiful streams, the Penitente and the Ruebens. Winding its way through the wild Patagonian landscape it emerges into the surprisingly mountainous area that encompasses the unique Las Buitreras beats, some 40kms from the river mouth. The flood plain that lies between these outcrops teems with birdlife, alongside large numbers of rheas, silver foxes, horses, hares, flamingos and guanacos. 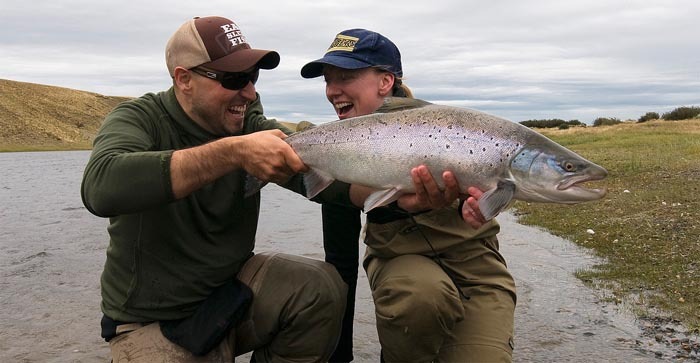 A trip to Rio Gallegos River offers the adventurous angler the opportunity to pit his skills against the explosive sea running trout of Patagonia. These fish can reach sizes of 25lbs and over and will reward the angler with arm wrenching takes and blistering runs, interspersed with regular acrobatic displays. Loop’s Las Buitreras lodge is home to the most prolific beats on the Rio Gallegos, consisting of over 40kms of both sides private water comprising over 50 named pools. 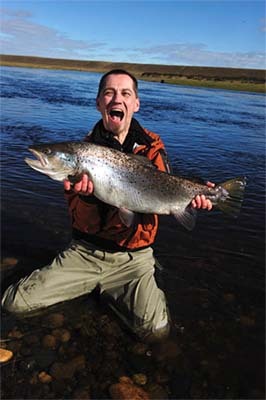 The fishing is exciting and varied with pools ranging from deep stony runs to cut banks and streamy shingle flats. Relatively shallow, the river makes for easy wading, obviating the need for fast sinking lines and creating an exciting and challenging fishing environment. 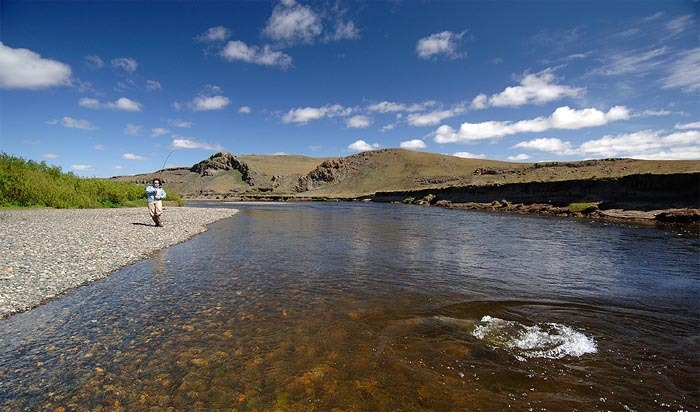 It is this variety in combination with the visually inspiring mountainous outcrops that makes this part of the Rio Gallegos quite simply one of the most spectacular stretches of fly fishing water in Patagonia. Sometimes explosive, always challenging, fishing for sea trout requires a level of skill, stealth and understanding that can frustrate the average salmon angler. 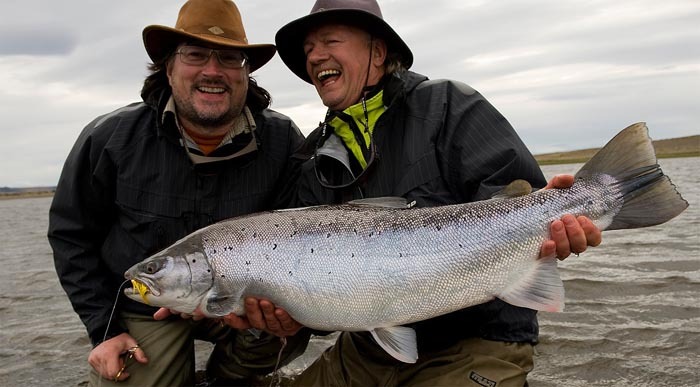 However, armed with the correct knowledge to unlock these secrets, the fishing on the Rio Gallegos can be immensely rewarding. To help you we pride ourselves on having who we consider to be some of the best guides in the world, now with 5 full seasons of experience on Buitreras. 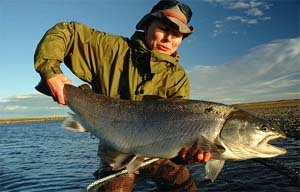 Each is a very talented fisherman, and they are some of the best casters and instructors we have seen anywhere. All of our guides are friendly, able to speak good English and usually keep a fly box tucked away with their secret deadly patterns they have created. They will ensure that you get the very most out of your trip. Loop has renovated a very old house on the estancia and furnished it with traditional “campo” style antiques. The living is comfortable and clean. There are 5 double rooms, 2 single rooms and a new annex with indoor barbeque and an extra room with 3 beds. In addition to the structural renovation, the entire heating, water, electrical and gas systems have been replaced. There is a wine cellar with a fantastic selection from the Mendoza and San Juan regions. It is also stocked with Cerveza Isenbeck, an outstanding local beer. Outside, there is a huge veranda, a spacious courtyard that is protected from the wind, and a large, fixed stone grill and terrace for barbeques. House wine and beer is included in the lodge rate but we do keep a wide selection of local wines not often available elsewhere and guests are welcome to purchase these at a very reasonable rate. No smoking inside the lodge. A diesel generator supplies the electricity in Buitreras and the power is 220 volt. The receptacles will accept common European plugs. The generator normally runs between 06.30 and 23.30. We have auxiliary battery power and there are 12-volt outlets in your rooms with lights that will function in the absence of generator power. Additionally, there are gas lamps here in the living/dining area and also upstairs in the hallway. These lamps can be used to advantage during late-night festivities! Water is supplied from a windmill at the top of the hill and though there are no limits for guests, we ask that they use it conscientiously. There are three very large thermo tanks supplying hot water and it is normally always available. There is a new telephone with Internet access in the lodge. During our season, continental Europe and Scandinavia are +4 hours and Great Britain is +3 hours. The USA is anywhere between -2 and -5 hours. NB: Telephone works when generator is on only. Hours for this and new number will be available before season. 13.30 – Return for lunch which is served about 14.00. Lunch is quite large, so a siesta follows. If you’re not in the mood for a siesta, you can go fishing in the home pool (a 5 minute walk), horse riding, fine tune your tackle and casting technique in the garden, or just relax with a drink. Whenver the fishing is done – return to the lodge where a mixed buffet is waiting for you. 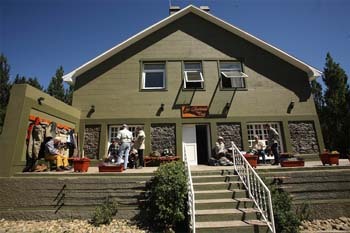 The Loop Company maintains a small gear shop within the lodge with a restricted selection of flies, leader materials, rods, reels, clothing and accessories. We have an emergency supply of equipment available to any guest who arrives without gear for whatever reason. We are also a field-testing station for Loop equipment and guests will have every opportunity to try out the latest equipment including prototypes not yet on the market. To get to Las Buitreras, you will need to make travel arrangements to Buenos Aires, and then a flight from Buenos Aires Airport to Rio Gallegos Airport. 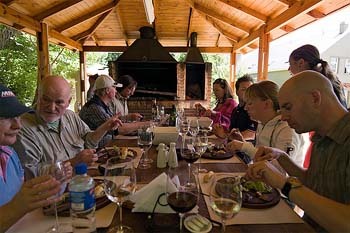 Travel from Rio Gallegos to Las Buitreras Lodge is provided. You must have a valid US passport and a Visa (valid for 1 month) to enter Argentina. The Visa is to be purchased together with your flight ticket or from your travel agent. Assistance with obtaining a Visa is available. Price includes: Ground transportation to and from Rio Gallegos airport; All meals, beers, wine, and soft drinks; Laundry service; and accommodations (based on double occupancy). Not included: Flight, staff & guide gratuities, visa costs, or any satellite telephone calls.